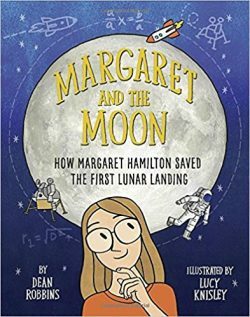 DESCRIPTION FROM THE PUBLISHER: Margaret Hamilton loved numbers as a young girl. She knew how many miles it was to the moon (and how many back). She loved studying algebra and geometry and calculus and using math to solve problems in the outside world. Soon math led her to MIT and then to helping NASA put a man on the moon! She handwrote code that would allow the spacecraft’s computer to solve any problems it might encounter. Apollo 8. Apollo 9. Apollo 10. Apollo 11. Without her code, none of those missions could have been completed.